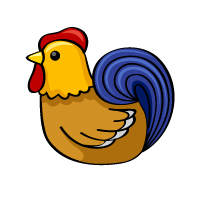 The rooster is the tenth symbol in the Japanese Zodiac. As a rooster (“tori” in Japanese) is associated with gain (“torikomu” in Japanese), it was considered as a lucky animal for business. This symbol represents “kindness” and “hospitality”. Roosters are quick-witted, efficient, and confident. They thrive on challenge and change, and are devoted to work. On the negative side, they have a suspicious nature and can be quite aggressive to others. Bite off more than they can chew. Do not think before they speak. Always have a packed schedule. Roosters are compatible with oxen and snakes. If these three come together, it generates a great positive power. Roosters also have a mutually beneficial relationship with dragons. Rabbits are the least compatible with roosters. In Japanese, a rooster is “niwatori” in romaji, and is written as “鶏” in kanji. In the Japanese Zodiac, however, it is often called “tori” and is written as “酉”.